I am acutely aware that it’s been awhile since I’ve written.This is my first step to change all that. I’m not taking this sitting down anymore. (These position puns are going to get old quickly, aren’t they). My last post – from last February– was about my effort to try out a standing desk. Hey, it was trendy then and I was finally stepping up and testing it for myself. 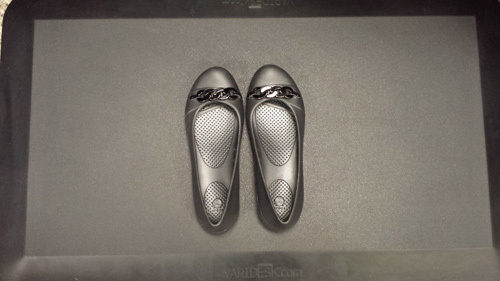 This is the picture I took back then of my standing desk mat and standing shoes –in my beloved dress crocs. I didn’t even get two weeks into my daffodil experiment until I was laid up in bed with what I thought was the stomach flu. After 3 weeks of rolling around from stomach pain, I then caught the regular flu – and yes, I had gotten my flu shot earlier. After 6 weeks of not being able to keep food down and being in pain every day (but 10 pounds lighter), I finally got to eat a radioactive egg and it was discovered that I had post-viral gastroparesis. While some of you may already know what this is, I describe it as your stomach is lying down on the job and not contracting in order to pass food through to your intestines. Instead, it kicks it back up in the wrong direction and you end up vomiting what you eat. (I’m trying not to get too graphic, so this is the cleanest way I know of describing vomit). It leads to all sorts of electrolyte issues and malabsorption, never mind playing bloody havoc with my blood sugar! Feel free to picture the next 8 months of me constantly feeling like I have a perpetual flu, plus like passing out most of the time, and so sick I couldn’t think straight. Losing my cognitive abilities – as insufficient as they may normally be – was by far the hardest part for me. I had to “eat my own dog food” as the saying goes. Everything I’ve learned over the past 15 years in terms of mental coping was put to the test. While I’m not one to ascribe events as “meant to be”, it certainly gave me an opportunity to work on what I think truly helps someone when they are overwhelmed and exhausted. It also gave me a kick in the rear to get going with what matters to me. I believe we make choices to make moments in our lives matter. I’m still breathing, so I still have a chance – and a choice. I want to share how I do that in the hopes that someone will feel like they are not alone. I have felt like I couldn’t talk about being so sick because “nobody needs to hear all that/ain’t nobody got time for that” but I was wrong. We need to hear about the hard parts. We can’t all be shiny happy people with high blood sugars pretending to be ok 100% of the time. Nothing is 100% of the time, even when you’re feeling crappy. While I could google a slew of information on the physical symptoms I was experiencing, what I craved was someone to comfort and reassure me even if there was no way to change the outcome of what I was going through. When you are scared and sure you should be on the way to the hospital and you are just so tired you don’t care – that’s the experience I wanted to read about. Luckily, I had the chance hear about hoping and coping when Brene Brown came out with her newest book “Rising Strong”. It’s all about the part where you’re down and out – courage, tenacity, resilience. If I could ever meet that woman I would have a hard time not bowing and kissing her feet: that book reminded me of what’s really inside of me – and inside us all. So I’m going to go off-script and share what I do when I feel horrible and am not coping well that helps me stay the person I want to be in life. With your forgiveness, I’m even going to share what I’m doing physically to make me feel better. (I joined a gym and hired a personal trainer – I can hear the gasps of surprise now). I’ve asked for help and gotten it from so many people, especially my husband who has been more support to me than I know how to express in words. So what did I chose to do? I’m standing up at my desk again. I’m still shaky and weak and experience foreboding joy that all this feeling good will come to a swift end, but I’ve also been reminded that there *is* something I can do to cope. I hope to help prop you up on your own two feet if you need it as well. In my mind, that’s what we’re all here for. Hang in there! I had gastroparesis years ago. Sickest part of my life. Go easy on the fat and fiber. Yogurt helps. Keep writing and get back in touch with why you started the blog. Thanks! It’s good to hear that this is in your past.I have renewed my love for yogurt: would love to hear if you feel like something in particular helped. Thanks so much for taking the time to comment. Take care! It took ages to diagnose. I had no known risk factors. I took propulsid until it was pulled off the market. I stay away from all malt and barley as it turns my stomach into a fermenting mess.